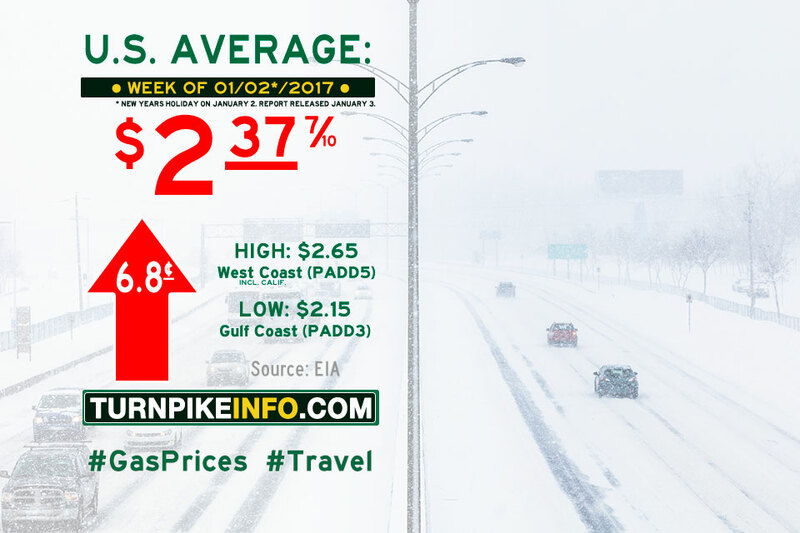 Fort Lauderdale, FL – The price of gas continued its unrelenting trek higher this past week, according to the U.S. Energy Information Administration’s weekly gas price survey. The first report of 2017 shows the cost of a gallon of regular unleaded gas jumped nearly seven cents per gallon over the past week, with the national average settling at $2.38 per gallon. Meanwhile, the cost of diesel pushed upward again during the week,according to the E.I.A. As with regular gas, diesel prices started the new year with a big price leap, about five cents higher than the previous week. The national average now stands at about $2.59 per gallon.